Over at the Honeynet Project they used to run security competitions which were quite a bit of fun. I remembered one in particular which I looked at but hadn’t completed. It dealt with the forensic investigation of a floppy disk. I was tinkering with an application to measure byte entropy and thinking of a way that it could be used in a forensic investigation. There is no point using the little application to analyse my terabyte (TB) sized drives so remembering the floppy disk challenge I downloaded the floppy disk image (1.44MB;MD5 = b676147f63923e1f428131d59b1d6a72). Solutions to this competition do exist and although I had read one of the solutions some 12 months ago I was fairly sure that any information was now gone from my head. So, hopefully, this won’t skew my investigation too much. The goal is to use entropy to discover information about the contents on the disk that aid in the completion of the challenge. Let’s go! Who is Joe Jacob’s supplier of marijuana and what is the address listed for the supplier? What crucial data is available within the coverpage.jpg file and why is this data crucial? What (if any) other high schools besides Smith Hill does Joe Jacobs frequent? For each file, what processes were taken by the suspect to mask them from others? What processes did you (the investigator) use to successfully examine the entire contents of each file? What Microsoft program was used to create the Cover Page file. What is your proof (Proof is the key to getting this question right, not just making a guess). I didn’t have these questions in front of me when I performed the investigation so sorry for being a little random. I wrote things down as I progressed and filled in a few lines in italics to reference the actual questions later on. I then unzipped the contents which gave me a single file named image to work with. Excellent. The rest of this article continues by using the now hacked to pieces ByteEntropy.java program. You’ll need to grab that file and compile it or download the classfile and run it as shown below; this doesn’t negate the requirement of having Java installed on your system. 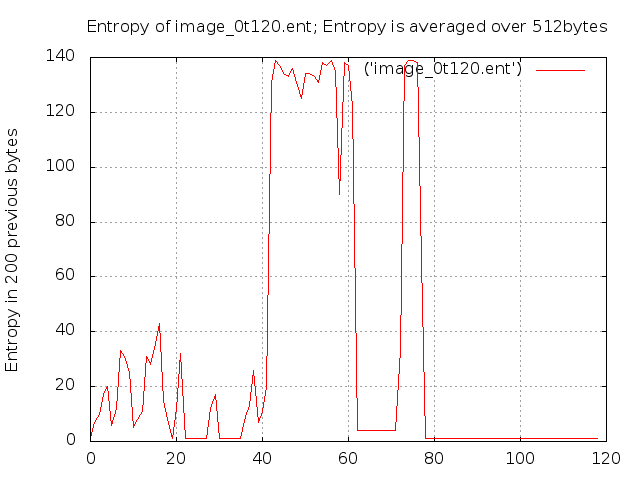 This command creates an entropy file image.ent of the number of different bytes in a sliding 200 byte window. 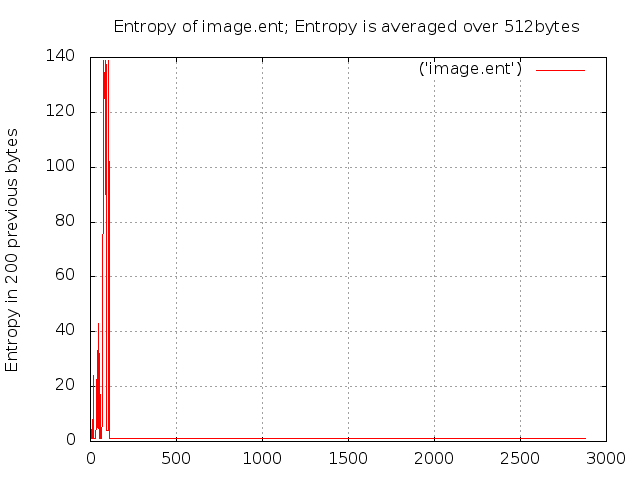 The entropy is averaged over 512 bytes (a cluster) and a graph Image.ent.png is also created. This is shown below. As can be seen from the graph there is nothing too interesting happening after the first 120 clusters. Let’s zoom in on that entropy. Here we have skipped over boot sector and FAT. We examine the entropy of the first 120 blocks as before. This gives us the following entropy graph (image_0t120.ent.png). Lets hypothesise about what could be on this disk from our earlier experimentation with different file types. Clusters 0-41 could contain plaintext as the entropy values are in the correct range. We also know from earlier experimentation entropy values of 125-145 indicate random, encrypted, or compressed data. There appears to be two files which fit the bill from the graph above around clusters ~42 and ~71. There is also some interesting low entropy chunks between these two files. The thing which interested me the most was a weird low entropy section of the disk between clusters 62 and 70. The contents should be easily viewable using a hex editor. So let’s take a look! 80007320  "+  nl nul   (0   "  nl nul records in   (   "  nl nul8   (   "
There is a repeated byte pattern (a28a0028) for much of that disk section and then out popspw=goodtimes. Is goodtimes a password? As this information is effectively found in the slack space of cover_page.jpgc we have answered question 2 when we prove this is a password in a later section. Time to look at that low entropy section in the first 41 clusters. 0000790: 0000 2608 0000 5202 0000 780a 0000 5200  ..&...R...x...R.
0000f60: 652c 2062 7574 2074 6865 7920 646f 6e92  e, but they don. 0000fc0: 6368 6f6f 6c20 7374 7564 656e 7473 2e20  chool students. 0001000: 6e74 6565 6420 7061 7963 6865 636b 2e20  nteed paycheck. 00010d0: 6861 7420 4920 616d 2075 7369 6e67 2e20  hat I am using. 0001120: 2077 6861 7420 796f 7520 7468 696e 6b2e   what you think. *0001810: 0807 22b0 0807 2390 a005 2490 a005 25b0  .."......$...%. *0001a40: 434a 1800 5f48 0104 614a 1800 6d48 0904  CJ.._H..aJ..mH..
0001a80: 4400 6500 6600 6100 7500 6c00 7400 2000  D.e.f.a.u.l.t. .
0001a90: 5000 6100 7200 6100 6700 7200 6100 7000  P.a.r.a.g.r.a.p. 0001b50: 0000 3300 0000 3400 0000 3b00 0000 3c00  ..3...4...;...<. 0001e90: 7461 6773 0680 5374 7265 6574 0080 3b00  tags..Street..;. 0001ed0: 6773 0780 6164 6472 6573 7300 8038 0000  gs..address..8..
0002130: 0700 5500 6e00 6b00 6e00 6f00 7700 6e00  ..U.n.k.n.o.w.n. 00021a0: 6d00 6500 7300 2000 4e00 6500 7700 2000  m.e.s. .N.e.w. .
0002ad0: 4a69 6d6d 7920 4a75 6e67 6c65 0000 6f00  Jimmy Jungle..o. 0004c00: 5200 6f00 6f00 7400 2000 4500 6e00 7400  R.o.o.t. .E.n.t. 0004d00: 5700 6f00 7200 6400 4400 6f00 6300 7500  W.o.r.d.D.o.c.u. 0004d80: 0500 5300 7500 6d00 6d00 6100 7200 7900  ..S.u.m.m.a.r.y. 0004d90: 4900 6e00 6600 6f00 7200 6d00 6100 7400  I.n.f.o.r.m.a.t. 0004e00: 0500 4400 6f00 6300 7500 6d00 6500 6e00  ..D.o.c.u.m.e.n. 0004e10: 7400 5300 7500 6d00 6d00 6100 7200 7900  t.S.u.m.m.a.r.y. 0004e20: 4900 6e00 6600 6f00 7200 6d00 6100 7400  I.n.f.o.r.m.a.t. 0004e80: 0100 4300 6f00 6d00 7000 4f00 6200 6a00  ..C.o.m.p.O.b.j. It looks like we may be dealing with one or multiple Microsoft Office files. We also found a letter shown below clipped from xxd’s ascii view. Hmmm could goodtimes be the password Joe speaks of? 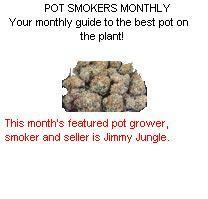 One Jimmy Jungle of 626 Jungle Ave Apt 2, Jungle, NY 11111 is Joe’s supplier and that’s the answer to question 1. Always use the best tools for the job. I am going to continue by using WinHex, I could use xxd but that would just make everything tedious and I have better things to be doing. You can get yourself a trial copy of WinHex if you don’t have it. Open the file image in WinHex. cover_page.jpgc is said to start at cluster 4200 This is complete rubbish as there is nothing in those sections of the disk which look anything like a jpg file (entropy wise). SCHEDU~1.exe is said to start at cluster 72. We know from the entropy values that this couldn’t be the case as the entropy is too high. This file is compressed, encrypted or contains random bytes. SCHEDU~1.exe is larger then the stated size of 1kb according the entropy graph. Jimmy Jungle.doc is a deleted file. Optional: Recovering deleted files. It’s likely that there is something amiss with cover_page.jpgc and SCHEDU~1.exe ; howeverJimmy Jungle.doc looks like it might be ok. In the WinHex view shown above right click on theJimmy Jungle.doc row and click Recover/Copy and save the file wherever you want. When I did this there where no issues with the file which contained the letter from Joe we found before. Lets look at the first block of this file. 0000030: 6c73 94c8 312a e349 0bdb a810 c270 9dfc  ls..1*.I.....p..
0000040: 1003 31a2 8e48 e83c 4b81 75c9 8b86 51af  ..1..H.<K.u...Q. 0000050: df2a 36c3 24db 1a7e 7546 98ee 4e56 4f05  .*6.$..~uF..NVO. 0000070: e21f ef90 a3f5 232d 3410 0248 54c1 62cb  ......-4..HT.b. This file is not what it appears to be. It is a PKZIP file (.zip) not an executable; see PKZIP file format. We already know it isn’t 1000bytes in length so lets check where this file is likely to end. 0000910: 9c23 e676 51aa ec21 dd21 0671 504b 0102  .#.vQ..!.!.qPK.. 0000920: 1400 1400 0100 0800 985a b72c c755 608d  .........Z.,.U`. With this information we can see that the file ends around line 0×970. 0×970 is hex so converting to decimal gives 2416. So I went to carve out the first 2416 bytes but the file was corrupt so I added an extra 4 bytes and everything worked out nicely. This appears to work as I unzip the archive I am asked for a password. I enter the goodtimes string I found earlier and WinRar happily uncompresses a file called Scheduled Visits.xls. A small segment of the file is shown below. Oh no, Joe is going down. He frequents Birard High School, Hull High School, Key High School, Leetch High School, Richter High School and Smith Hill High School. This is the answer to question 3. It is obvious that this file does not begin at cluster 4200. Instead cluster 42 looks far more likely. A quick examination of cluster 42 gives me the evidence I need. 0000090: 3232 3232 3232 3232 3232 3232 3232 ffc0  22222222222222.. The jpeg header looks good so we are good to carve. A quick look at cluster 64 (entropy dips) reveals a probable end of file. 0002790: 522a 5d49 a5b1 d14f 0786 94da 53ba 5bbf  R*]I...O....S.[. 00027a0: 2b5e ff00 7e96 dfaf 4b1d ab5d 69d7 7713  +^..~...K..]i.w. 00027e0: 4684 7984 6ec9 c807 805b 2bd0 c464 30a1  F.y.n....[+..d0. 0002800: ad20 dbdd 1c38 8853 834a 9cae bf5f ebe6  . ...8.S.J..._.. The file appears to end after 0×2818 (10264) bytes. Lets carve! I am not interested in finishing the challenge as described, just trying to illustrate that entropy is a useful tool when investigating any sort of data. It very quickly uncovered attempts that had been made to hide data: the renaming of a files to indicate they had another format and messing around with root directory entries to hide where files start and end. I managed to find all the important bits within a few minutes which is good going. Anyhows give it a go! You can’t end there what about questions 4, 5, and 6? ***sigh*** ok then. Question 4: As shown above Jimmy jungle.doc was deleted, SCHEDU~1.zip was password protected, SCHEDUL~1.zip was renamed SCHEDUL~1.exe, the size of SCHEDU~1.zip was misrepresented, the starting cluster of cover image.jpgc was misrepresented. Question 5: is outlined throughout this document. Question 6: is a bonus question and I am not feeling in the bonus getting mood — if you need to know take a look at the top 30 solutions on Scan 24. It would be nice if the visualization could some scale to a larger image. Interesting reading this old post. About a week ago I was in a briefing with Encase Forensics and they were bragging about their capability to perform the same entropy based file checks. They acted like the idea was original but I have seen research going back well before they integrated it into their tool. If the SOB’s are awarded a patent I can hardly believe they should own it.